PRESENTATION: Blister packs in POS Pack. MATERIAL: Polycarbonate handle and clip. Net 100% nylon. 4 x 20211-C01 replacement nets blister packs. The display is the ideal way of presenting the product in the point of sale. The eye-catching colours and attractive display will help the products sell quickly if it is positioned near the till or in a place where customers pass it. 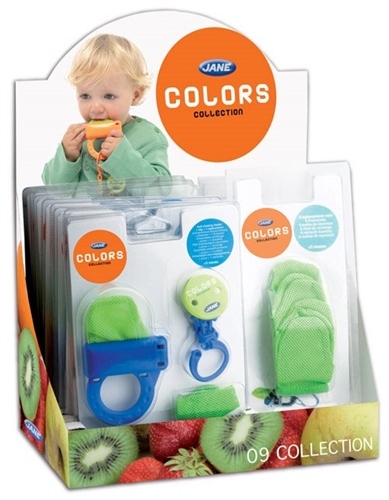 5m+ The JANÉ anti-choking feeder is ideal for the baby to start tasting new flavours. Fruit or biscuits can be put inside the net, then the net is fastened and closed with the plastic clip. To prevent the child from dropping the feeder on the floor it has a clip to help the child hold it better. The blister pack includes a spare net. The advantage of this net compared with the others on the market is that it weighs very little and the child can hold it easily and safely. The blister pack contains 6 replacement feeder nets. Dishwasher safe.